In a night that saw three undefeated prospects lose their perfect records on ShoBox: The New Generation on Showtime, Dyah Davis upset super middleweight prospect Marcus Johnson via unanimous decision by the scores of 98-91 twice and 96-93. In the co-feature bouts, New York’s Gabriel Bracero handed Danny O’Connor his first loss via unanimous decision by the scores of 80-72 two times and 79-73, while Vincent Arroyo knocked down Willie Nelson three times en route to a majority decision with scores 74-74 and 75-73 twice. After insisting throughout fight week that his team devised a plan to beat Houston ’s Johnson (20-1, 15 KOs), Davis (19-2-1, 9 KOs ) backed up his words with a unanimous decision upset. From the first bell, Davis used the classic stick-and-move approach to upset Johnson’s rhythm. By acting as a moving target, Davis disabled Johnson’s ability to settle in to the fight and land his signature left hook. 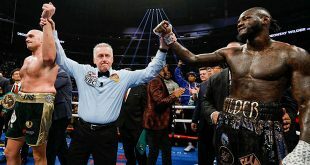 As ShoBox fans have seen from Johnson in the past, he fought Davis cautiously in the early rounds to time his opponent’s punches – but was never able to execute his game plan or build momentum. 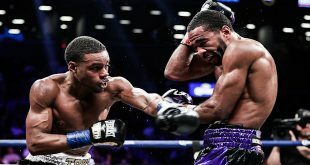 Though clearly the bigger puncher, Johnson made no adjustments to the problems Davis presented and the fight stayed close through eight rounds. In the ninth, Davis landed a perfectly placed right hand to the body that forced Johnson to take a knee – the first time he’d been down in his career. The 10-8 round put pressure on Johnson to finish strong in the tenth but he was unable to knock out Davis and lost the first fight of his pro career. 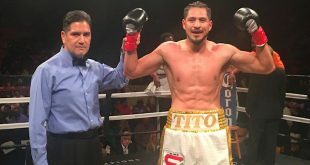 In an “0 must go” matchup between unbeaten fighters, Bracero (15-0, 1 KO) protected his untouched loss column with a convincing unanimous decision victory over O’Connor (14-1, 3 KOs ). With neither fighter possessing knockout power, the two junior welterweights exchanged toe-to-toe for most of the contest. Bracero, however, threw the more effective punches. Drawing blood from O’Connor’s nose in the fourth, the 30-year-old Bracero applied constant pressure throughout each round, showing more poise and consistency than his 25-year-old opponent. By fight’s end, Bracero won almost every round on the judge’s scorecards for an important victory on a national stage. In the night’s opening bout, Arroyo (11-1, 7 KOs), from Amherst , N.Y. , vanquished the undefeated record of Nelson (16-1-1, 10 KOs ) with a dramatic majority decision. Though Nelson, 23, controlled parts of the fight, Arroyo produced all the headlines in the eight-round welterweight contest. Immediately after having a point deducted for holding, Arroyo sprang back into action by dropping Nelson with a left hook. Nelson rebounded well for the next few rounds before Arroyo rocked him with another left hook in the sixth. Popping up before referee Rafael Ramos reached a ten count, Nelson was clearly in a daze. Arroyo scored one more knockdown in the seventh round with a right hand before winning the fight on two judges’ scorecards, with the other judge scoring the fight a draw. The telecast will replay on Thursday, April 14 at 10:30 p.m. ET/PT and be available On Demand from April 11 through April 24. Promoted by DiBella Entertainment, the “Rumble on the Rio” originated from the Laredo Energy Arena in Laredo , Texas . Curt Menefee called the ShoBox action from ringside with Steve Farhood serving as expert analyst. Gordon Hall is the executive producer of ShoBox with Richard Gaughan producing and Rick Phillips directing.